Are you in the market to buy a new or used car? Chances are you’ll probably take out a car loan to help pay for it. And you’re certainly not alone. According to Experian (a credit reporting agency), approximately 56% of all new car purchases and about 50% of used car purchases were financed with a car loan in Q3 of 2017. But what happens if you have bad credit. Can you still get approved for a car loan? Yes, you can. What other bad credit myths are floating out there? The team at LendingArch has compiled a list of the top misconceptions surrounding bad credit car loans. Read on to see which myths get busted with out top 10 Misconceptions of a 0 Down Car Loan. This could not be more wrong. Bad credit happens. It doesn’t mean that you’re a bad person or financially irresponsible. People make mistakes and life can throw curveballs. At the end of the day, it’s not about your bad credit score, it’s about what you do to help improve it. Check Experian, Equifax and TransUnion to make sure there are no errors on your credit report. If you find any, report them asap. Start paying bills on time (or even early). This will show that you’re serious about finances. Open a secured credit card. For example, open a new checking account and deposit $500. With a secured credit card, you’ll be able to get a line of credit for $500 and have the ability to make timely payments thus creating a positive payment history. Don’t let your old mistakes haunt you. Be proactive in changing the way you handle and deal with money. For example, develop a monthly budget that you can stick to. Furthermore, the team at LendingArch aims to truly help our customers. From providing excellent customer service throughout the whole process to reassuring clients that we’ll be able to work with them regardless of their current credit and financial situation to finding solutions to help them get the funding they need for life, at LendingArch, our customers always come first. Even with a less than stellar credit score, there is no need for you to pay cash to buy a lower quality vehicle. Not only will it take time, budgeting, and energy to save up for a car, it also might not put you in a better credit situation in the future. In fact, buying a car in cash can be a harder and more stressful way to obtaining a new ride. Down payments can be helpful as they can help to secure a loan and lower the interest rate; however, a down payment isn’t required. Even if you have bad credit, you won’t need a down payment for a car loan. 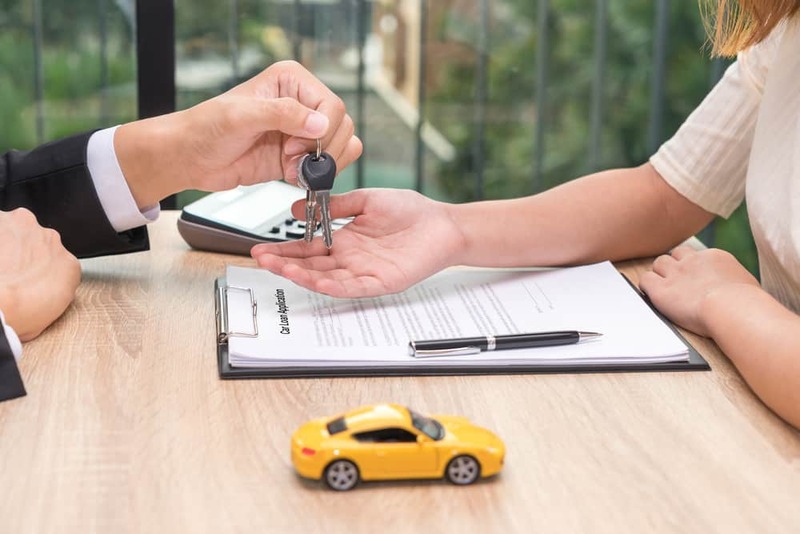 The down payment only affects the car loans terms and what type of vehicle you’re buying, it won’t affect your chances of loan approval or denial. While it’s true that obtaining a car loan will increase your amount of debt, it will certainly not worsen or damage your credit score. In fact, a car loan can actually help to increase your credit score over time. All you need to do is to make sure you pay your monthly bills on time. The only potential negative consequence a bad credit score can have is bringing the possibility of a higher interest rate. By utilizing the LendingArch platform, we’ll connect you to several lenders offering different solutions so you can choose the best possible scenario for your situation and the future. We even go so far and create a “love score” which indicates how likely you’ll get accepted for a particular loan with a specific lender. The options that you’ll most likely be accepted for will appear first on the list, and as you scroll down, the chances of approval decreases. Canadians love our platform because it reduces the risk of being rejected and eliminates multiple hits on your credit report (which can be detrimental to those with bad credit). Additionally, we are actually the only company in Canada who currently offers this type of service. This is simply not true. Similar to a down payment, co-signing a loan in order to get a car loan can help lower both the interest rate and monthly payments. It will not affect whether or not you get approved for a car loan. Lenders who work closely with those with a poor credit scores will evaluate your income and ability to pay back a loan. Looking at your credit score and (re)building it. We’ve covered some great tips on how to do this above in myth #1, but looking at your credit report and taking out a secured credit card are two great ways! Get a part-time or freelancing job. The more monthly income you have (and the more money you have in the bank) will give you a stronger case to lenders as it shows them you’re serious and a lower risk. Plus, we bet that you can even save some extra money to enjoy some road trip fun on the weekends. False. There are a variety of Canadian lenders who specialize and work with those who have little to no credit score. They understand that bad credit happens and won’t hold it against you. Our team at LendingArch also does the same. We’ll always treat you with respect as we know that most of our customers come to us having been turned down before. Due to this delicate situation, we stay focused on helping you and are not concerned by your credit score. Additionally, we strive to make you feel good about saving both time and money which is why LendingArch is built as a one-stop shop giving you the necessary tools you need to feel empowered to make the right decision. Oftentimes, people with bad credit assume that they are in no position to bargain or to get a good deal on a car loan. Feeling this way can compel someone in that situation to take the first deal that a lender provides them. This can actually harm you. Even with bad credit, we recommend that you comparison shop; that way you can find the best deal that’s suited to your specific needs. With LendingArch, we take the hassle out of going to multiple vendors. Drawing from a pool of 40 lenders who have been fully vetted by our professional and expert team, you can rest assured that the rates and companies we match you with are the best of the best. Here at LendingArch, we along with our lenders, always aim to give you the best options possible so you can find the right car. Of course, having said that, we can’t guarantee that you’ll be able to get the car of your dreams this time around (we know that you might be eyeing the newest BMW convertible, we are too). The car we can guarantee that you can afford will fit your current lifestyle and get you one step closer to buying the car of your dreams. While it’s true that over time you’ll pay more interest on a loan with longer terms, short-term loans might not be the best option for your current budget and financial situation – one that has a term for four or more years might be more reasonable. When finding the best loan, it’s important to consider both the overall cost of the entire loan in addition to the monthly payments. Bonus tip: lenders are usually open to negotiating the terms, it never hurts to ask for an option that will be better suited to your needs. This should never negatively affect your chances of getting a bad credit car loan. More often than not, lenders will look at your entire work history, not just your most recent job. Reasonable lenders will also understand that buying a car means you’ll have dependable transportation to get you to and from work. This means you’ll be able to hold steady employment, which is a positive. Fill out our down payment or you can call 877-624-5761.
Review your matches with assistance from one of our customer service team members. Ride around town in your shiny new car. Let LendingArch help you get a down payment today.